Your estimate may look different — this net price calculator explanation is meant for informational purposes only. Not all types of aid show up on all estimates. Other aid may be applicable such as military benefits and outside scholarships. Download a PDF of the net price calculator explanation. Tuition & Fees: Based on 12-18 credits per semester. Room & Board: Includes an on-campus residence hall and assumes the highest meal plan option. Books & Supplies: The average estimated cost of textbooks and other school supplies for the upcoming year. Other: The estimate average of off-campus expenses. Costs may vary considerable from student to student. These are scholarships that are exclusive to St. Scholastica students. Benedictine Scholarship: This is a merit-based award. The dollar amount shown here is an estimate. Total Estimated Scholarship: Scholarships do not have to be repaid. St. Scholastica offers many other scholarships — see our scholarship page for more information. Gift aid includes scholarships and grants provided by St. Scholastica and/or outside entities and does not need to be repaid. Actual gift aid may vary based on need, and effort put forth by the student in seeking additional scholarships. Estimated Other Gift Aid: This is grant money provided by the state, federal government or St. Scholastica and does not require repayment. 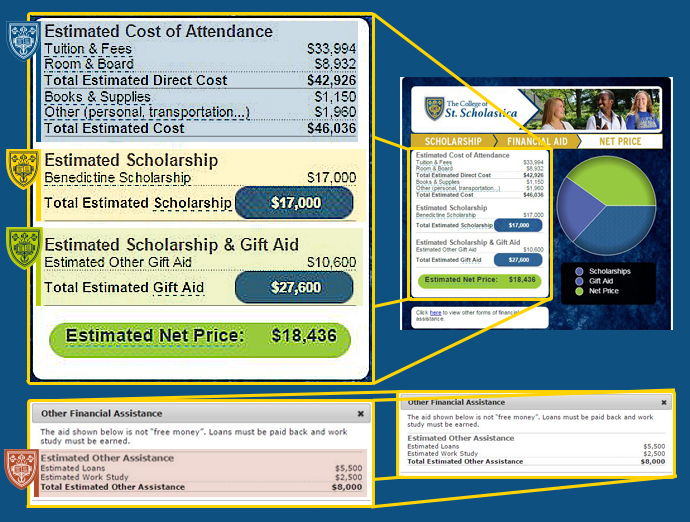 Total Estimated Gift Aid: This is a combination of total estimated scholarship and total estimated gift aid. Estimated Loans: These include federal subsidized and unsubsidized loan options. Estimated Work Study: This is need-based student employment as determined by the FAFSA (http://fafsa.gov/). Estimated Net Price after Other Aid: This is the estimated amount you are responsible for that will need to be paid out of pocket, through a payment plan or through private student loans. For more information regarding your specific situation and calculator results, contact OneStop Student Services at (877) 287-8716 or onestop@css.edu.